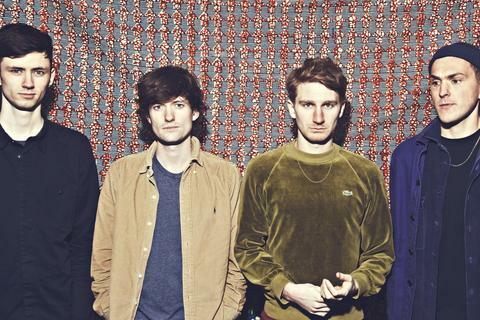 As the first signing to Paul Epworth’s Wolf Tone label, Glass Animals have polished their pulsing indie electronica-by-way-of-RnB under the watchful eye of Britain’s most relevant producer, who here takes on an executive role to the production by the band’s vocalist and writer Dave Bayley. Having left the confines of their creative hub in the woodlands of Oxfordshire (referred to as The Shed), the band took up residence at Epworth’s London studio in the Autumn of 2013. It’s a move that has instantly developed their sound, merging their love of analogue with digital, and transforming their psych-fuzz into something a whole lot wilder and more expansive. Gooey is the latest fruit from those album sessions, and the first to truly showcase that new direction. It’s a slick, sultry affair, lilting and looped. Tranquil in its build, all reverb and pulse. Its approach is unashamedly experimental in both its tone and approach, and caught the eye of Radiohead’s Colin Greenwood who, as ambassador for Independent Venue Week, recently booked Glass Animals to headline a sell-out show at Oxford’s Jericho Tavern. Armed with a fully-realised LP to come later in the year, a neuroscience degree (Bayley’s not just a hat-rack), and a seriously impressive live set-up, Glass Animals are primed for a very exciting twelve months and beyond.